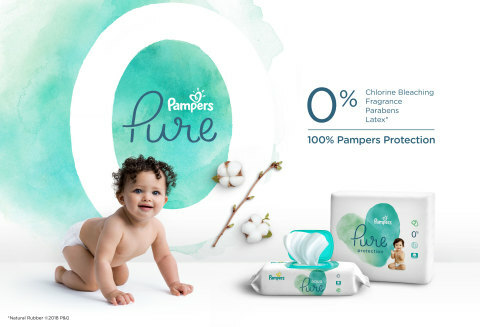 CINCINNATI--(BUSINESS WIRE)--For parents searching for diaper and wipe options in the “natural” category who don’t want to sacrifice performance, the new Pampers Pure Collection offers another choice. It is the first-ever diaper and wipe collection made with premium cotton and other thoughtfully selected materials, stylish prints, and the Pampers protection parents around the world know and trust. And it all started with a mom at Pampers. After giving birth to twin girls, Sara Giovanni, a scientist at Pampers, couldn’t find an option that had everything she was looking for in diapers and wipes for her daughters. She hated making compromises on softness or protection or style, and knew many other parents felt the same. Inspired by her own experience, Sara made it her mission to help create a Pampers diaper offering that was made with premium cotton, plant-based and other soft materials, protected against leaks just like Pampers, and looked cute and stylish. This became the inspiration behind the new Pampers Pure Collection, made with 0% chlorine bleaching, fragrance, parabens and 100% Pampers protection. Pampers Pure Protection diapers are also independently reviewed and accredited as skin safe by the Skin Health Alliance. Each size option of Pampers Pure Protection diapers features different stylish, fun prints (llamas, corgis, and sloths, oh my! ), and the much-loved Wetness Indicator. Pampers Aqua Pure wipes are designed to give parents Pampers' highest water content wipe while still delivering outstanding skin protection. The wipes are crafted with carefully-selected ingredients including 99% pure water and a touch of premium cotton, making them safe and soft even on delicate newborn faces, hands and bottoms. The Pampers Pure Collection holds itself to the same safety standards as all Pampers products. More than 25 million babies and toddlers use Pampers every day making it among the safest products in the world. Pampers Pure Protection diapers are available in sizes N through 5 for a suggested retail price of $11.99. Pampers Aqua Pure wipes are available for a suggested retail price of $5.97. Pricing is at the sole discretion of the retailer. The Pampers Pure Collection will be broadly available online and at major retailers nationwide as early as February and continuing into March.